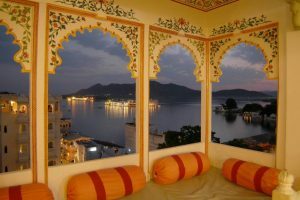 Mewar Haveli is one of the hotels we suggest you stay at in Udaipur. It is placed in a romantic city, perfect for honeymooners, luxury travellers and mid-range budgeters. This honest review will help you decide if it meets your criteria for your trip. Romantic – Yes, especially if you have a lake facing room. Even otherwise, it is a cosy hotel with tasteful attention for detail and the roof top restaurant takes up a different mood from morning to sunset to night. Backpacker friendly – Not really, initiating interactions with other guests in the hotel did not seem easy. It gets a varied age group and families, so not a high percentage of young backpackers. Children friendly – Mewar Haveli does not have any games room or activities per se for children. Yet, families with kids would be comfortable here. It is easy to step out and get around on foot; again the restaurant with the lake view would always be fun for the kids. 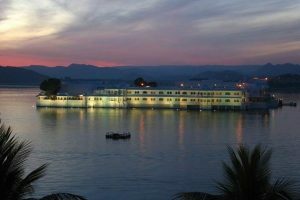 Rates – Remember Mewar Haveli is between a budget and value for money hotel. Rooms start at INR 1400 and go up to INR 2100 approx. If you can get one of two lake facing rooms, they are a steal at the price. The element the view can add to stay is indescribable. 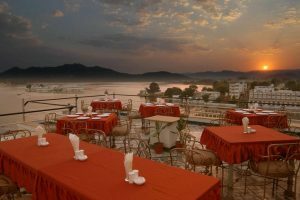 That you can just walk to the city attractions around, or stroll around the town from Mewar Haveli. That it has an elevator to get to the rooftop restaurant, other similar hotels around the lake do not have an elevator. And it feels a little uncourteous to walk up passing other people’s rooms. The rooftop restaurant prepares lovely non-greasy, fresh and non-spicy vegetarian food. And the prices seemed fair. The rooms are of different sizes and most of them are compact. Not a deal breaker, but if you travel with a lot of suitcases you might fill the room up. That they only have two lake facing rooms. The rest are equally comfy, but after having stayed at both, you want to try and book in advance to get a lake facing room.